Kebab has a distinct identity as adainty from the Middle East, which is particularly favoured by everyone in India. 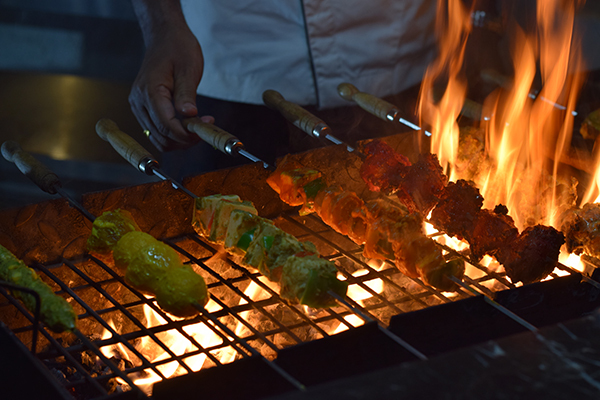 Spiced meat are cooked, strung in small pieces with alternate bits of onion, garlic, and ginger on metal or bamboo skewers, and rotated over glowing charcoal embers: Sheekh kebab, Shammi kebab, Tikka and other variations. The dish read kebab – roasted marinated meat on spits while basting with fat. This has been described in Sanskrit literature and reference in Mahabharata – Manasollasa. While Ibn BatTuta records kebab been served by royal houses during sultanate period. In the Ain-i-Akbari, kebab is listed as one of the class of foods in which meat is cooked with accompaniments. The meat when marinated with cream and roasted gives the class malai-tikka a popular food among the Bohri Muslims. Whenever we think of fine dining accompanied by a luxurious culinary tasting journey, we think about meats – being roasted and skewered the right way in the spitfire. Tingling spices, captivating aroma, succulent taste, that transform the meat to a good kebab. And what makes a kebab even better? Fusion. When you infuse Middle Eastern flavors into a decadent kebab, you are set for a culinary journey. Taking it on a step further Fortune Park Sishmo has come up with an appetizing concept buffet, making it a summer special. A breezy terrace, outdoor grill and chilled beverages- Sishmo has redefined relaxing. When we walked in (actually, out to the terrace! 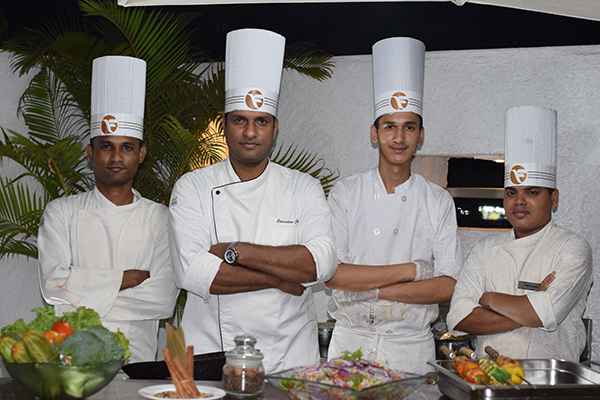 ), Chef Pabitra walked us through the menu for the day. Your mouth will salivate just by listening to the brief menu. Menu included both vegetarian and non-vegetarian options. Vegetarian options were- KhumbGalouti, Methi Mutter,MakaikiSeekh, HariyaliPaneer, Tandoori Subz Khazana, Bharwan Aloo, Chukundari Chop, Cheese Cherry Pineapple Stick, Hummus & Baba Ganoush and Pita Bread. The Non-vegetarian option included- Kandhari MurghTikka, Lamb Galouti with Coin Paratha, Jugalbandi Seekh, Lasooni MurghTikka, Tawa Marchi and Ajwaini Jhinga. 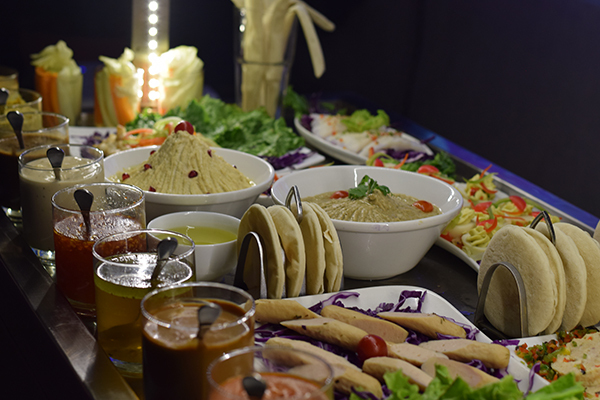 From this menu, we picked four of the signature kebabs served in the lavish buffet spread. No, you don’t need to be afraid of tasting this complex simple dish. Hummus, is a Mediterranean staple. So is, Baba Ganoush. Baba Ganoush main ingredient is purple eggplants. Roasted eggplants blended to perfection with lemon, garlic, tahini and sea salt. The result? A smooth, uber creamy and a balance of tang and sweet – Baba Ganoush. Garnished with generous drizzling of Olive oil and cherry tomatoes, one gets lost with the flavours of this vegetarian delight. Paired with hummus and pita bread, we had one of the healthiest & tastiest food out there. Chef felt that why should vegetarians be left out on the galouti kebabs. Galouti kebabs are made from minced meat with over 128 aromatic spices. This dish was made from smoked mushroom mince and the aromatics, bet you won’t miss the meat. It literally melted in our mouths. Cooked on a tawa and served on bite size paratha (read coin paratha), we understand the reason of the paratha when we tried to lift the kebab with our hands. It opened, literally, like a flower! Coin Paratha acts more like an edible plate. What a galouti! Devised for the toothless NawabAsa-ud-Daula, Galouti is the kebab of Nawabs (literally!). It is known that the original galouti uses over 150 spices and it contains some of the most exotic spices. This Lamb Galouti made by the Chef and his team can be termed as an Odisha Rendition of the traditional Lucknowi version. A smooth, creamy and silky texture of this kebab is definitely a front-runner in the best-kebab-of-the-night race. Tenderized and minced the meat is rested with spices for a day (before it goes to the platter). Then formed into bite-sized patties cooked on a Tawa and served on a Coin Paratha. You already know the purpose of the Paratha! If you ask us to pick the most luxurious kebab of the night, it will be a deadbeat competition. Both the galouti kebabs- Khumb Galouti and Lamb Galouti, were so delicious and similar in taste our dialogue went on for 30 whole minutes that which was vegetarian and which was lamb! Thanks to Chef Pabitra for clearing the air! If you are confusing a vegetarian galouti with a lamb one, just imagine how royal it would be tasting! With inputs from Apurba and photographs by Tveshaj & Neel.